The Plough and Harrow Inn on Slade Road just east of Little Sutton was built on the site of a row of cottages and other old buildings. This isolated settlement on the fringes of Little Sutton consisted of a row of eleven houses and cottages known collectively as Muffins Den - today only one of these dwellings remains, still bearing the name Muffins Den. One of the buildings demolished to make way for the public house was a Baptist chapel. The chapel, built in 1869, was a successor to an earlier meeting house of a society of independent dissenters. Most of the members of this group, which was in existence by 1770, were artisans carrying on cottage industries such as weaving, nail-making, carpentry, tailoring and shoemaking; the society was probably inspired by a similar meeting already established in Tamworth. Their first meeting house of the Little Sutton group was a nailer’s workshop. The Rector of Sutton mentioned this Independent Meeting House, “which is duly licensed at the Sessions”, and noted in 1772 that “they who are called Methodists do also resort there, to the amount of eight or ten families”, and “their number is rather increased lately because they have now a regular teacher, Mr. Abraham Austin”. This is not the Mr. Abraham Austin who was Warden of Sutton in 1746 and 1747, and involved in the restoration of Sutton Parish Church in 1760, but a young grocer’s apprentice from Birmingham. The Rector noted that Abraham Auston had “ a very good natural understanding, but had no education for the Ministry” or any qualification usual among the Dissenters. Austin soon became a Baptist as did most of his followers and “the hearers increased and the room became too small to accommodate them.” A nearby building was purchased for £80 and converted for use as a Baptist church in 1774. The church flourished until Mr. Austin left them in 1785 to become the minister of Fetter Lane Chapel in London. The congregation of Little Sutton Baptist Chapel, as it was known, continued to grow until about 1800, when the character of the area began to change. There had been a wide scattering of cottages around Little Sutton where cottage industries were carried on, but gradually, as the industrial revolution progressed, production moved to the towns, particularly Birmingham, a town of 1,000 trades. The artisans who had been the backbone of the independent church had all disappeared by 1840, when all eleven dwellings at Muffins Den were occupied by farmers or farm labourers. Nevertheless, when the old chapel was in a ruinous state, the Baptists managed to build a new one on a nearby site, opened in 1869. 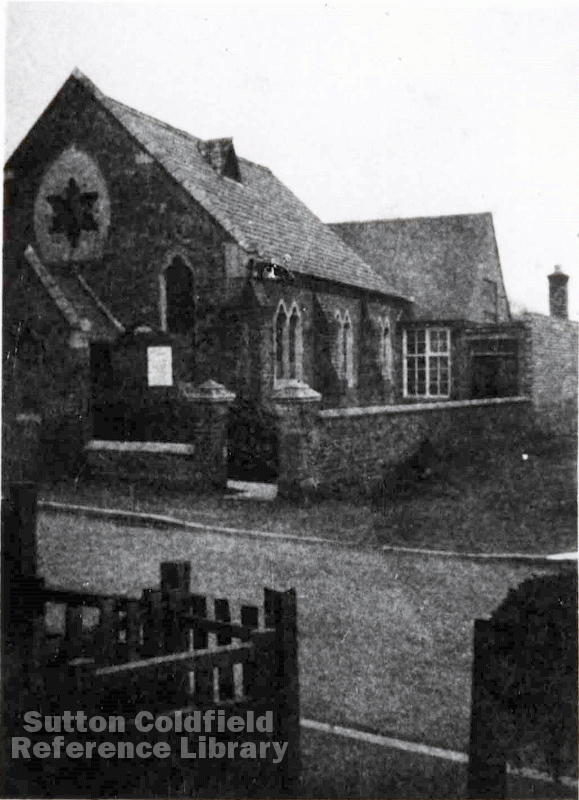 A hundred years later the site was acquired for development, all except one of the Muffins Den houses were demolished along with the chapel, and the congregation moved to their new premises, the present Four Oaks Baptist Church in Grange Lane.